Tucked away in the north end of Transcona, down a gravel road past several other industrial operations, is the Cando Rail Services Winnipeg Mechanical Facility. The sprawling 38-acre grounds, which also serve as headquarters for the company’s local short line operation (Central Manitoba Railway), are peppered with several large buildings, 4.5 miles of yard track that sit full of railcars and locomotives and specialized railcar loading equipment. James Mutcher, Manager of Mechanical Services, points to one of the projects in Cando’s railcar and locomotive repair shop in Winnipeg. 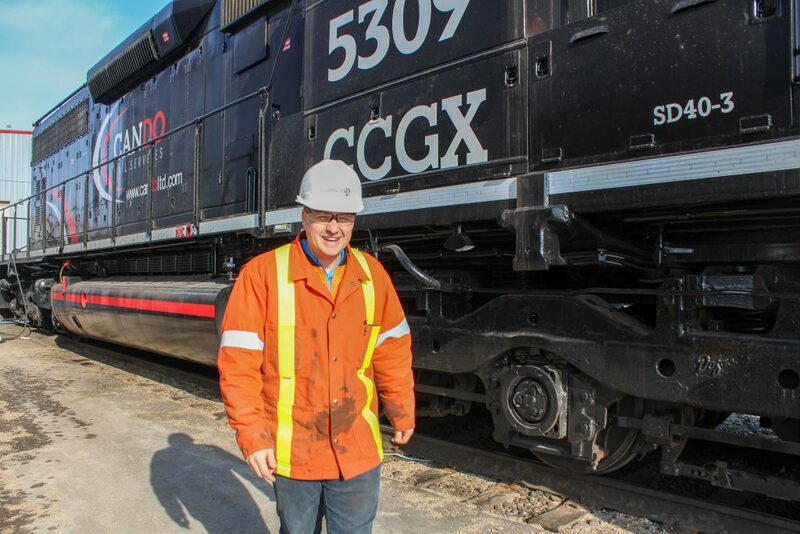 On an average day at Cando, three or four locomotives are being repaired or completely restored, and three to six railcars are getting serviced, all under one roof. Over the past few years, it’s been one of the fastest growing operations of its kind in North America, serving as the hub for Cando’s fleet of 50 locomotives. That’s one of the largest privately held locomotive fleets in Canada, more than double the size it was five years ago. James Mutcher, Manager of Mechanical Services for Cando Rail Services, can give a progress report on every job in the shop. On this particular day, Mutcher points out a locomotive that’s having an engine change out. It will take between 300 and 400 hours, and several skill sets, to do the work necessary to get it back on the road, but Mutcher says it’s a fun challenge due to the complexity, and the fact that they don’t get to do jobs like that very often. Employees working on a complete engine change out. This project will take a team of electricians and mechanics, and between 300 and 400 hours to complete. It all started in the 1990s, when the company began growing its industrial rail switching operations for customers across the country. This growth meant purchasing more locomotives, a massive investment at about $500,000 each (depending on if they are purchased or leased). As a side effect of the growth of this side of the business, the locomotive maintenance and repair side of operations was born, really taking off in the last decade. 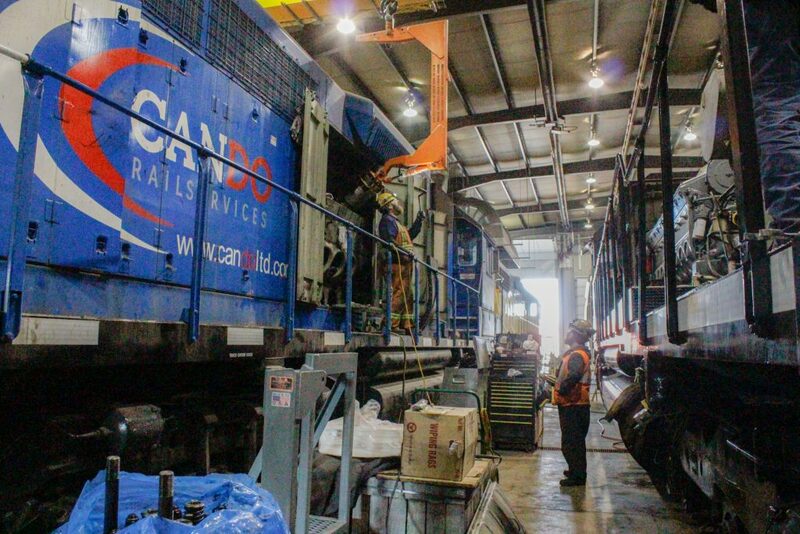 Now, a team of welders, mechanics, and engineers at Cando’s Winnipeg Mechanical Facility are responsible seven days a week for all of Cando’s locomotive rebuilds and repairs. The facility also offers AAR certified railcar repair and railcar cleaning. Mutcher explains how locomotives are cared for in the winter to ensure the engines don’t get damaged. Locomotives are the driving forces that allow Cando to increase efficiency while performing rail switching and unit train operations at mines, mills and refineries across North America, in addition to operating three short line railways. While the facility in Winnipeg is the central hub for repair, Cando also provides mobile repairs and service. To be able to offer fast mechanical service in the case of any problems out in the field, remote mechanics are hired so that certain repairs can be done outside the shop, saving the customer time, and increasing efficiency. To be prepared, Cando has a warehouse separate from the main facility that houses $1.5 million worth of parts that go to overhaul projects in the shop and get shipped out to the field for emergencies. Mutcher says they can usually get a part out in 12 to 24 hours when necessary. Cando’s freshly painted black locomotives with their red and white Cando decals stand out in the industry. These locomotives are almost ready to leave the shop and help out at job sites across the country. 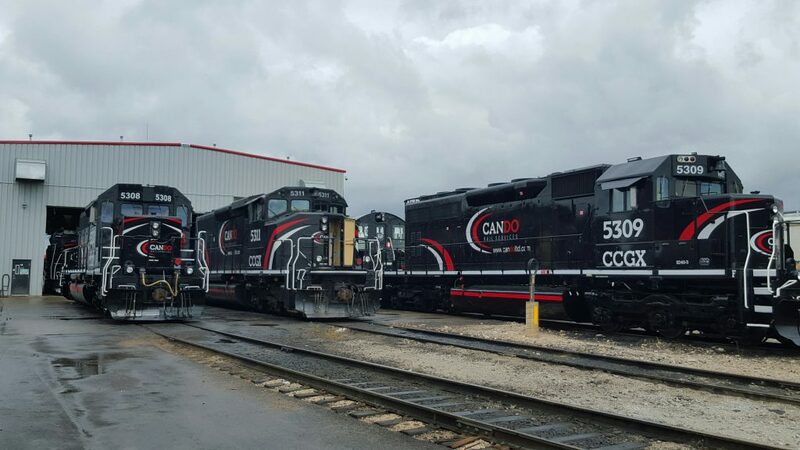 The final step of the rebuilding process for Cando is painting its locomotives with the company’s signature slick black colour with white and red accents, and branding it with the new Cando logo that was redesigned in 2015. 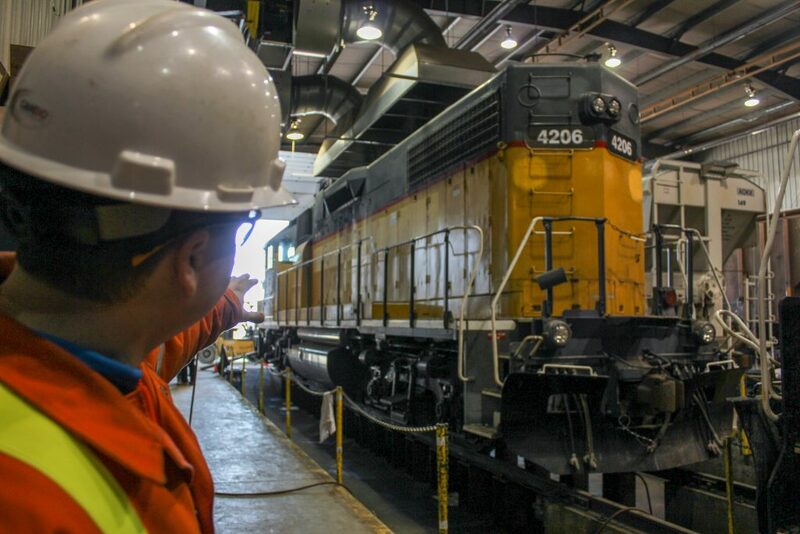 The painting process allows each acquired locomotive to be reborn as a Cando locomotive that will pull customer railcars at one of the more than 25 industrial worksites Cando operates at across North America. Phillips says people in the industry comment on how sharp the locomotives look — a sure sign that Cando’s sleek black locomotives are getting noticed. While Cando has changed a lot since its humble beginnings in 1978, its impressive locomotive fleet is only one part of what is driving Cando forward into the future.